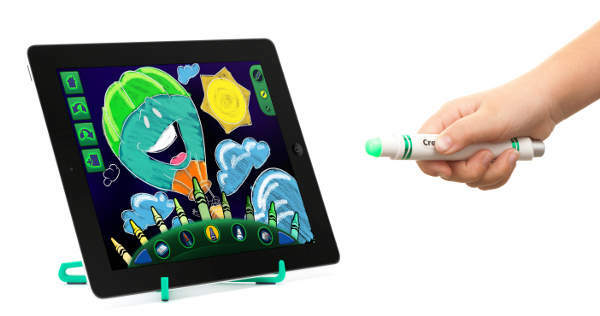 Crayola continues to roll out digital products for a new generation exploring creativity and fun. This month they announce the Crayola Light Marker. Waving the Light Marker at your iPad allows the tablet's front facing camera to pick up the movements and translate them into creative drawings, colors, and patterns. Free apps that come with the marker include activities such as dot to dot, paint splatter, hide n' seek, and free draw. Though kids are used to touching the crayon or paint brush to the canvas, this system relies on more of waving motion from a distance, like a Wii controller. It allows for a more free-flowing drawing. Precise drawing will require some finer motor skills on the part of your child. The Crayola Light Marker will retail for $30 when it's available this spring.